What is a Heidelberg pH Test? A friend mentioned he had this test on a comment on one of my pages on Facebook. I had never heard of this test before, so I wanted to do some research into it. As it turns out, this test really does encompass a wide range of things it tests for. It reminds me of the Smart Pill test, in a way, but broadened. So, after reading about it, below is the information I found concerning the test. There is no trauma or discomfort associated with our test, and the results of the Heidelberg test are available to the doctor as soon as the test is complete. Why go through an unpleasant procedure like the nasal-gastric intubation, when you can have a Heidelberg Diagnostic test? As the examining Physician, you will always hear a wide spectrum of complaints from your patients. 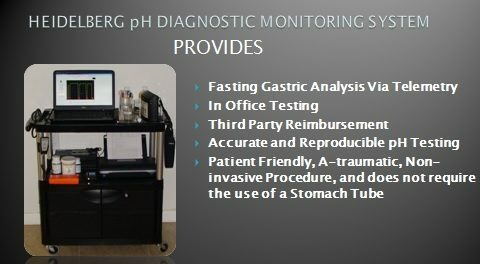 By adding The Heidelberg pH Diagnostic System to your method of testing, you can be assured of having a comprehensive overview of the patients’ first stage of digestion. We believe you will find that the results of your treatment protocols will be enhanced from the pH data, which this test provides. There is no guess work involved and the test results are reproducible. 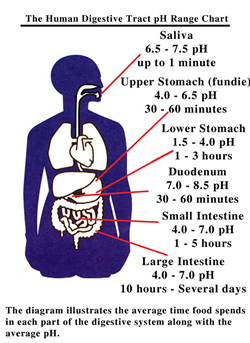 When the total digestive system is in pH balance, You can expect higher levels of conversion and absorption of ingested foods and medications. In addition, you can expect an appreciable enhancement of the patient’s immune systems! This is a very encouraging step for all aspects of successful treatment! The digestive system supports the immune system. Without proper conversion and absorption of the foods, medications, and supplements, the immune system cannot function at its optimum level. The Heidelberg pH Diagnostic System can be used to bring the first stage of digestion to its optimum performance level for good conversion and absorption. The Heidelberg Diagnostic technology has been used over the past 39 years by Researchers and Pharmaceutical companies throughout the world. Some of the recognized Pharmaceutical companies are; Pfizer (Global Research and Development), Boehringer Ingelheim, Tap Pharmaceuticals, Bayer, Merck, Glaxo, SmithKline and Novo Nordisk (Denmark). When a pharmaceutical company develops a new medication, they use the Heidelberg diagnostic system to perform pharmacokinetic studies to determine the activity of the medication on the human body. This is where, in many cases, the Heidelberg technology becomes a valuable research tool, in assuring the safety of a newly developed medication. These studies are use to determine bodily absorption, distribution, metabolism and excretion of drugs. Before testing newly developed medications on humans, many pharmaceutical companies test their products on animals. Tests on animals include the use of swine, dogs, monkeys, etc. As part of their approval process, the Food and Drug Administration (FDA) requires testing of many newly developed medications in humans before being approved for use in the open market. Researchers in many medical teaching colleges and research facilities use the Heidelberg Diagnostic system for testing the side effects of drugs. They also monitor the body pH when testing new vaccines to counter the effect of contagious diseases. The Pharmaceutical Grade Heidelberg Diagnostic system can be configured to test from 1 to 8 subjects at the same time without interaction. Custom built systems can be configured to test 16 or more subjects at the same time without interaction. Our current Bibliography of research studies contains over 150 published studies, conducted by researchers, pharmaceutical companies, clinicians, medical teaching colleges and hospitals. A copy of these studies are available upon request. The Portable Heidelberg pH Diagnostic System is an innovative system that is ideal for any busy practice, where a stationary desktop computer system would have it’s limitations. It can be transported from one room to another, or from one facility to another. The dedicated laptop computer, and a compact micro-jet printer, is placed on a movable medical grade laboratory cart that has lockable casters, with an Uninterrupted Power Supply (UPS system), with an 8 foot electrical cord. The laboratory cart has a built security feature that allow you to safely store your computer, printer and other equipment in a lockable storage cabinet, when they are not being used. The portable Heidelberg pH Diagnostic System can be used for single, or multiple, patient pH Diagnostic Testing. The standard clinical grade Heidelberg Diagnostic systems can be configured to test from 1 to 8 patients simultaneously without interaction. Our custom built systems can be configured to test from 1 to 16 patients at the same time without interaction. The FDA requires that system operators (nurses or technicians) be training in the use of the system and do testing under the supervision of a licensed physician. Third party reimbursement depends on individual states and individual insurance companies, and the form in which the CPT coding is submitted. The Heidelberg pH Capsule package insert reads: CAUTION: Federal law restricts this device to sale only by, or on the order of a qualified physician. A patient history and examination are required before administering this diagnostic test. Example: Crohn’s Disease, or any history of intestinal blockage, adhesions and/or history of bleeding. We are active with clinical pharmacology and pharmacokinetic research studies with major universities and major American and European pharmaceutical companies. View our testing software simulation. The per test disposables are pH capsules, distilled water and Saline. Everything else necessary, for over a hundred pH tests, is included with the system purchase."